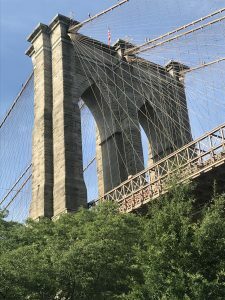 Brooklyn Bridge & Both Sides too | Custom & Private New York Tours, Inc.
Visit America’s first suburb, Brooklyn Heights and DUMBO (down under Manhattan Bridge Overpass) and observe how neighborhoods are transformed virtually overnight. Williamsburg, a fascinating tale of contrasts and creativity featuring views of Manhattan that are unbeatable. Prospect Park, Grand Army Plaza, Park Slope is an oasis in the center of Brooklyn featuring the most magnificent blocks of brownstones, tree-lined streets, oversized 19th century mansions and once dubbed the best place to live in the United States. Back to Manhattan visiting Wall Street, Federal Hall where Washington was inaugurated in 1789, The New York Stock Exchange, evidence of the wall’s existence, pockmarks from a 1920 terrorist act and The Trump Building, once the world’s tallest for five days in 1931. Visit The Gehry building on 8 Spruce Street, a shocker, The 911memorial, St. Paul’s Cathedral and City Hall park where you’ll see the oldest city hall in the United States in continuous use, 1811. On to some neighborhoods including The Five Points, Bloody Angle, Chinatown, Little Italy, Soho and The Village.